Every so often, I get asked the question: “why do you ‘do’ yoga”? It’s usually in a yoga class, but sometimes it’s over a particularly lovely drink in one of the beautiful places that I visit in the Ribble Valley which is where I live. It’s a good question to ask. Over the years, I have simply responded with a “why not?”. This feels like a fairly legitimate response. A bit like Edmund Hilary responding “because it’s there” when asked why he climbed Everest. When I was younger, my ego used to trounce in and suggest that it kept me fit and bendy. As I got older, and spent more time in the various yoga practices, I found that ‘yoga’ did something more profound: it returned me to my self. And this is where it gets complicated, because by my ‘self’ – I don’t mean “a very english yogi”. What yoga does, is that it takes me back to the deepest part of who I am: perhaps who we all are. That’s the late at night, smokefilled bar room reason dealt with. Now for the cool clear light of day reasons. 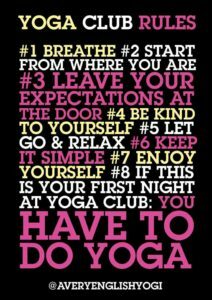 We live in a world of lists and a very English yogi has learnt from the best list maker in the world – Mrs Yogi. So here’s my list of reasons why I ‘do’ yoga – or perhaps more realistically, why yoga ‘does’ me. Oh, I forgot…the power and effect of yoga practices are for me nothing but a dazzling blind light. Shining light into the dark nooks and crannies of our daily lives. That’s my starter for 10 : what about you? Why do you ‘do’ yoga? Newer Post Keep it simple	Older Post Gomukhasana : cow face pose or light headed pose?